Park operators in the City of Salem, Oregon are posting unique signs alerting people that an owl could swoop down and ruin their day. A barred owl has attacked four people in the park in recent months. 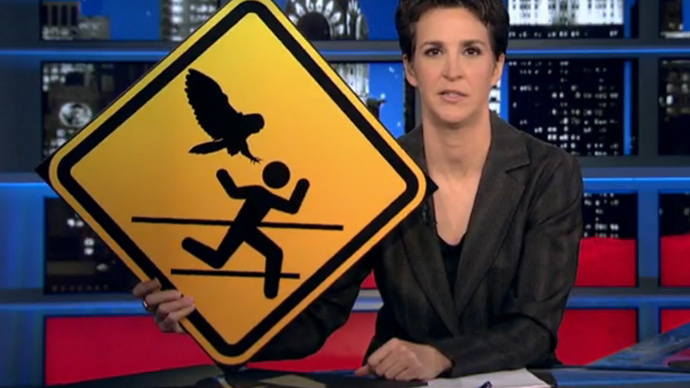 The park had previously posted flyers about the owl attacks, but in a segment on wacky politics in Oregon, the owl attacks became a segment on MSNBC’s Rachel Maddow Show on February 5. Maddow suggested the city should post a vivid yellow warning sign using the iconic pedestrian stick figure bent forward at a run. Hovering above – and in fast pursuit – with claws extended like a bird of prey. Salem officials liked the idea enough that park officials secured the rights, created 20 signs, and installed them around Bush’s Pasture Park. "It's just making people aware that there's an owl there that for whatever reason swoops down and goes after people's hats," Mark Becktel, the parks and transportation services manager, told the AP. Animal specialists said owls are nocturnal predators and prefer rodents and field mice, but a barred owl took an interest in runners who use a nearby jogging hill and began attacking them on their runs. So far there have been four victims, and the owl has been confirmed to be a barred owl. The Oregon Statesman Journal ran an owl-naming contest and suggestions were voted upon by readers. The names included “Owlpachino,” “Hoodini,” “The D'cap-ee-taker” and “Rachel Madowl,” but the winner name was “Owlcapone,” scoring 177 likes. David Craig, a biology professor and animal behavior specialist at Willamette University, said barred owls tend to be aggressive and territorial during mating season. "When owls are nesting, they're really territorial,” Craig told KGW CBS Portland when the first attacks began. "Great horned owls as well as barred owls often swoop down on people, but a very small percentage get clawed and attacked like that."